Nancy Anderson Designs is this months featured shop at the On Fire for Handmade Gift Guide. 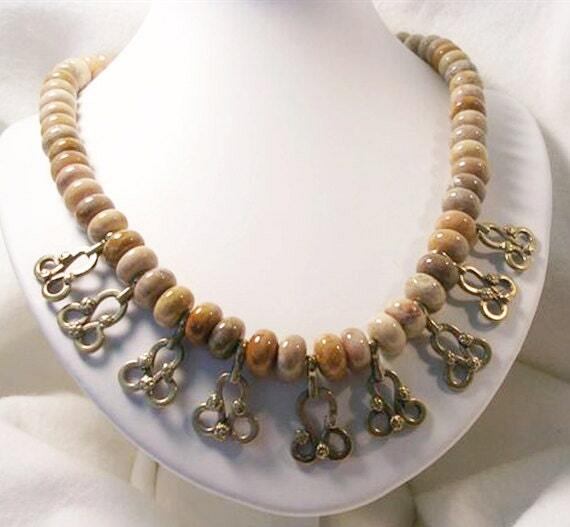 You will find stunning, handmade creations you will love to wear! Everything you can imagine to adorn yourself from Head to Toe. Must have pieces for every jewelry box! Jewelry….do we need it? Do we love it? I think most women enjoy wearing a beautiful necklace, the perfect bracelet, or a special pair of earrings. I have been designing and creating jewelry for seven (plus) years. Designing is an enjoyable, creative challenge. Attention to detail is an important component to the process. I love variety so my designs are mostly one-of-a-kind, ranging from classic to bling, to ethnic. Jewelry is for fun, compliments, enjoyment, and to enhance what one is wearing. That is my design goal. Nancy Anderson Designs wants you to have the very best quality jewelry that you will love to wear! Along came a gift of beautiful jade from my parents trip to China. What to do? Happily the Signed up for a class and now I have a closet, and then some, full of beautiful gemstones, antique silver pieces, pearls, ethnic beads, etc. All, of this to choose from when creating, for the most part, one-of-a-kind necklaces, bracelets, and earrings. I am proud of my attention to detail which I learned in the beginning and is a benchmark to all of my designs. This new creative avenue for me covers seven plus years. Returns and exchanges – Your satisfaction is important. PayPal or credit card. Special arrangements are available for checks or money orders. Please contact me if you prefer to send a check or money order as the method of payment. All items shipped USPS First Class mail. UPS shipment available upon request. If you are interested in earrings or a bracelet to match or complement a purchased piece, special orders are available. To provide special care to each piece Items will be shipped in individual boxes. One note as to care of your necklace……some items are strung on a strong thread so hanging such items on a jewelry tree will, over time, cause the thread to stretch. 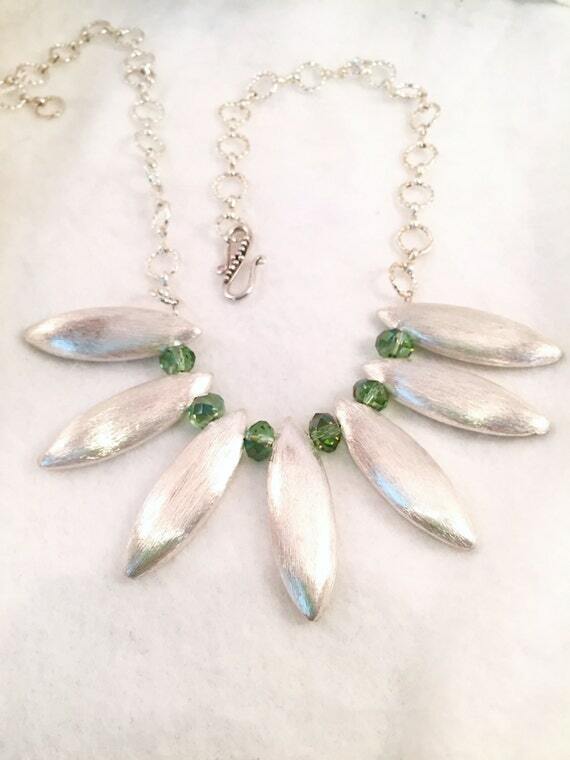 Step out in style with a beautiful, handmade jewelry piece by Nancy Anderson Designs! Annes Knits is this month’s featured shop here at the On Fire for Handmade Gift Guide! At Anne’s Knits you will find stunning fall and winter fashion accessories that you will love to wear! Everything you need to jazz up your wardrobe this season. I have been knitting for over 40 years and love to knit items for babies and children too. I also like to knit scarves and shawls. Step out in style with a Fashion Accessory from my Shop! Fashions for Her, children and more! All made with Love.. All Made by Hand! Fashions you will love to wear! Treat yourself or Gift to your special someone. You will find a style that is just right for everyone in this Handmade Fashion Shop! I enjoy making scarves and shawls and hope you see something that you like. I will also make custom items. 25% from all sales goes to local animal rescues in Tucson. Please contact me if you would like an item shipped overseas . I have been knitting since the age of 12 and I am now in my fifties! Originally from Scotland , where I knitted items for a yarn store. I now live in Arizona. I have made a number of custom items for a family in England who love Disney characters. Knitting is my passion and I enjoy spending any free time I have with knitting needles in my hand! I enjoy knitting baby and children’s outfits and also like to knit scarves and shawls. Custom items available on request. I donate a % of all my sales to local animal rescues here in Tucson. I have been knitting for over 40 years and always have knitting needles in my hand ! I am originally from Scotland and now live in AZ. Break it Up Designs is this months Featured Shop. At BreakitupDesigns you will find beautiful, hand made Mosaic Decor for your Home. Unique designs that will jazz up your home. These Handmade pieces make great house-warming gifts too! Working with mosaics and glass is my passion. As my shop name implies, I started all this with a broken item, namely a favorite flower pot given to me by my son. Two frisky cats broke the pot and I tried to come up with a way to salvage the broken china. I designed a plaque from the pieces and the ideas kept coming. Birdbaths, tabletops, flower pots and stands, house numbers and then frames, coasters, lazy susans, switch plates and more. Most of my products are one of a kind and all are handmade pieces of my own design. I use a variety of glass including hand cut mosaic tiles,stained glass, Beach/Sea Glass, Abalone Shell, glass and stone tiles, re-purposed china and glass beads in a variety of styles. As my shop name implies, I started all this with a broken item, namely a favorite flower pot given to me by my son. 2 frisky cats broke the pot and I tried to come up with a way to salvage the broken china, which was beautiful. I designed a plaque from the pieces and the ideas kept coming. Birdbaths, tabletops, flower pots and stands, house numbers and then frames, coasters, lazy susans, switch plates and more. Most of my products are one of a kind and all are handmade pieces of my own design. I use a variety of glass including hand cut mosaic tiles,stained glass, Beach/Sea Glass, Abalone Shell, glass and stone tiles, re-purposed china and glass beads in a variety of styles. Many of my frames incorporate recycled, upcycled or re-purposed materials such as stone tile, pottery and glass. I try to salvage materials that otherwise might be wasted by giving them a new purpose. These coasters are gorgeous. Even my Grandson had to gasp for air when I showed him the coasters. Fantastic workmanship wonderful quality. Very heavy coasters that will last for years. Great shop owner, easy to work with. I will definitely purchase again from this shop. Thank you!